Cover Art by Geof Isherwood. George Bush’s plane is forced to land in Athens . . . and the Greek authorities arrest him for war crimes! They want him to explain why he used enhanced interrogation techniques like waterboarding on prisoners while he was president. What’s the first thing that Bush does in response to this predicament? He orders spinach pie from a Greek restaurant near the Acropolis. This is the first big surprise in The Apology. 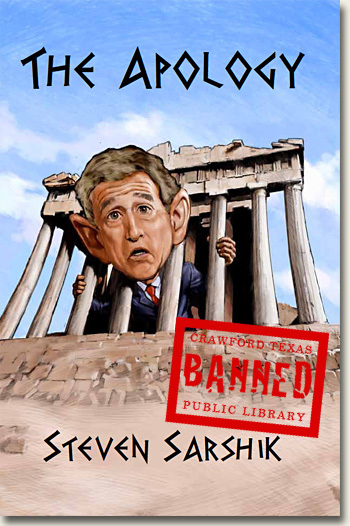 How does George Bush, the outrageous Texan, manage to grapple with his problems in the land of Socrates? Does he decide to drink hemlock? A clever, and sometimes riotous, political tale with appearances by Barack Obama, Joe Biden, Rahm Emanuel, Hillary Clinton, Condoleezza Rice, James Baker, General Petraeus, Antonin Scalia, Clarence Thomas, Ben Ginsberg, Alan Dershowitz . . . and of course, Lindsay Lohan. Faced with charges that he committed war crimes while in the White House, Bush decides to enlist the help of a beautiful Harvard MBA student who is working part time for the CIA. He comes up with an ingenious strategy to prove  once and for all  that waterboarding is not really torture. Does this strategy work? Or is Bush tripped up by his own brilliant mind? You’ll have to get to the last page of this compelling story before you find out Bush’s fate.